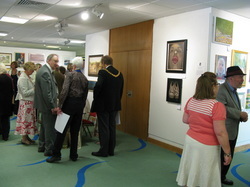 The Mayor holds an Art Show every year in aid of charity, a lovely venue with lots of visitors. 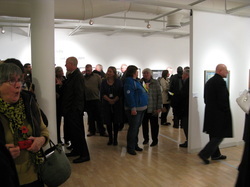 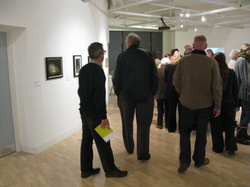 This was the private view of The Lock Gallery's first open. 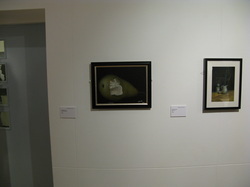 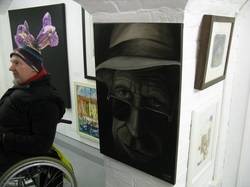 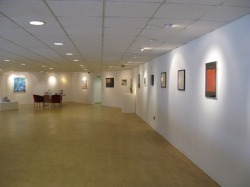 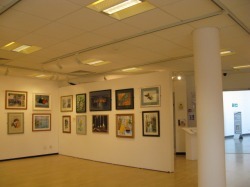 The Lock Gallery is a wonderful gallery and is situated at The Canal Basin, Coventry, West Midlands. 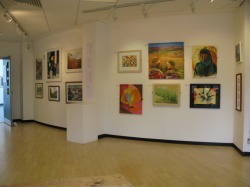 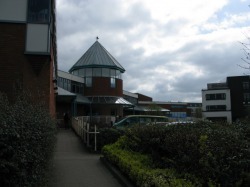 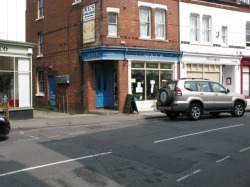 The new Rugby Art Gallery, Rugby, England holds an Open every year. 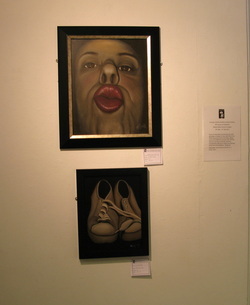 This was one of my paintings that was submitted and accepted into that exhibition. 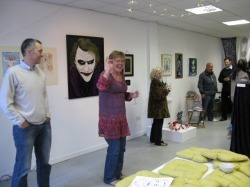 One of my very proud moments! 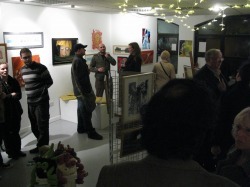 The CWSA held an exhibition at The Lock Gallery, Canal Basin, Coventry and was the first time I had submitted anything to them. 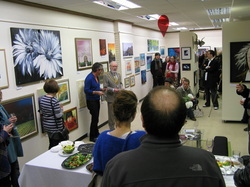 I was totally shocked when I won "Best Newcomer" award for these two paintings. 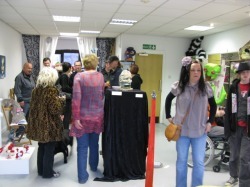 One of my best moves was to join this group. 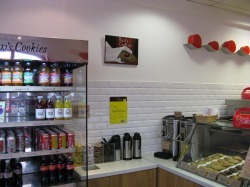 This paintings was produced for the Manageress of Ben's Cookies to fill the space on the wall above the coffee machines, she said it just needed something there and that's how we came up with the idea for the painting. 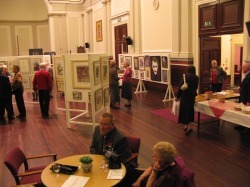 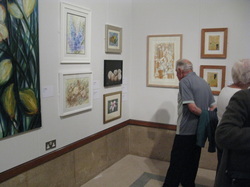 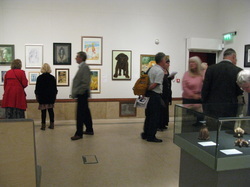 The annual exhibition held by Coventry and Warwickshire Society of Artists at Rugby Art Gallery, Rugby, Warwickshire. 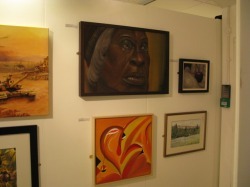 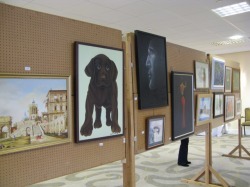 Just look at this wonderful gallery space that is in The Stratford Leisure Centre. 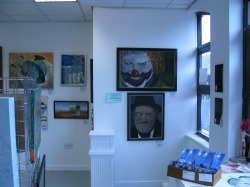 My painting is hanging down at the end on the right hand side. 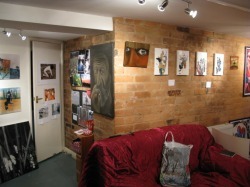 This where I took three paintings today, a lovely little gallery in the basement of a Health Food Shop called Gaia which is in Regent Place, Leamington Spa. 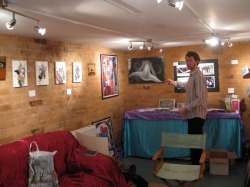 I really liked it and the owner had some lovely pieces in there. 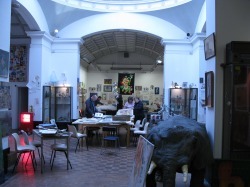 Can you see the Ostrich? 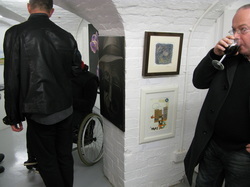 Dog, John and Tango at The Art Show. 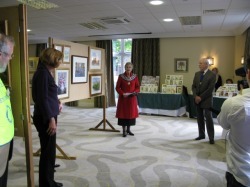 Kenilworth Festival, The Holiday Inn, Kenilworth. 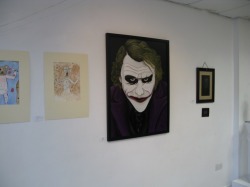 The Joker at The Lock Gallery, Canal Basin, Coventry as part of Make me a Monster Exhibition. 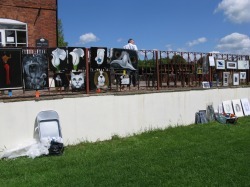 Art on the railings at Newbold Comyn Arms, Leamington Spa in aid of Zoe's Baby Hospice 30 May 2010. 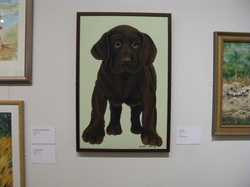 This is "Dog" and this painting was commended in this exhibition, Sep/Oct 2010. 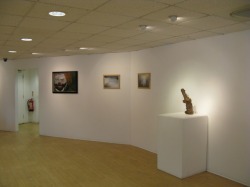 "Keef" is now showing in the new Lock Gallery, Studio 23, Canal Basin, Coventry West Midlands. 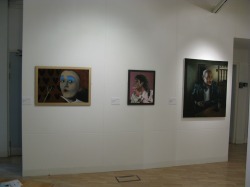 This painting will be there until the middle of December 2010. 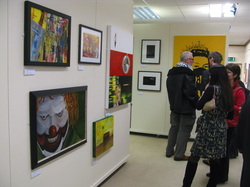 "Coulrophobia" hanging in the exhibition and below The Lord Mayor of Leamington opens the exhibition.